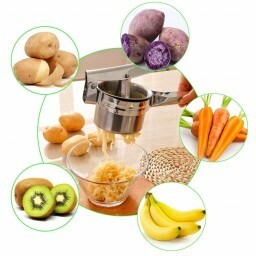 ★ RESTAURANT QUALITY MASHED POTATOES:With this product, you can achieve a creamy, heavenly dish quickly and conveniently. Gone are the days of subpar mashed potatoes. It is comfortably cushioned and ergonomically designed. Never worry again about having to spend hours preparing mashed potatoes. 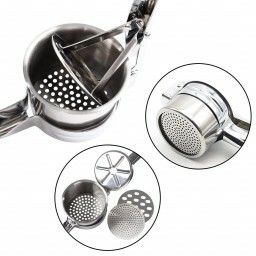 ★ MADE OF HIGH-QUALITY STAINLESS STEEL: Crafted from 100% rust-proof, high-quality material, this product is resistant to stains, corrosion, and deformation. This means its longer lasting than most other ricers on the market. 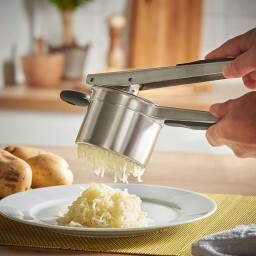 ★ MULTI-FUNCTIONAL: Our potato ricer can also be used for other cooked vegetables, such as sweet potatoes, carrots and you can also use it for even a baby food press. Want to prepare fresh fruit juices? It also functions as a fantastic fruit drink maker!" ★ 3 RICING DISCS-FINE, MEDIUM, & COARSE RICING: Compared other potato ricers those include just a single permanent ricing disc, you'll spend less time preparing, and more time taking the credit for a delicious, high quality meal with our product." ★ CONVENIENT CLEAN-UP: Completely dishwasher friendly. 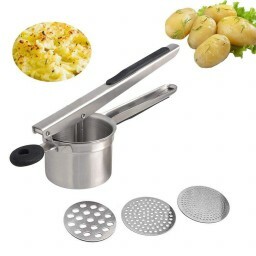 Plus, it is made of non-stick steel material that slides off food residue even with just running water alone. With hanging loop integrated to the kitchen device itself for creative storage solutions making this mashing tool easy grabs when needed.